As an astrophysicist, I had very high hopes for Interstellar, particularly with Kip Thorne, a famous theoretical physicist, on board as producer and science adviser. I was disappointed with some glaring issues with the science, but overall it is relatively solid. 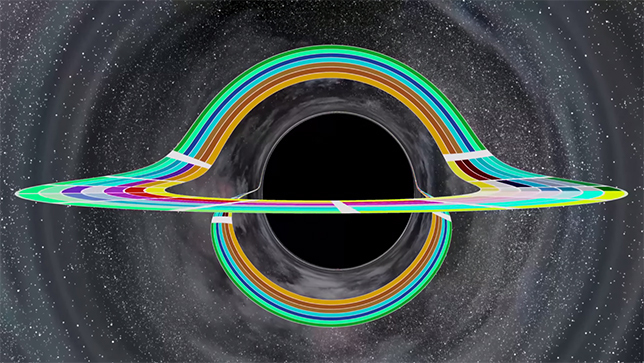 A lot of painstaking effort went into visualizing the wormhole and black hole to make them as realistic as possible. The real trick is to correctly simulate the bending of background light around these objects. Light gets warped as it passes through distortions in space-time, such as black holes and wormholes. Light always follows the most direct path through space (and time). In flat space this is a straight line, but this changes as the geometry of space-time changes. For example, light from a star behind a black hole can get warped so that an observer would see its image repeated and stretched all around the black hole. I particularly loved the black hole visualization because it included an accretion disk. As matter (i.e. gas from the surrounding area) falls onto the black hole, it swirls around and forms a disk. This happens because that gas is never falling directly into the black hole. Think about when you drop a penny into a big funnel. If you drop it off-center, it will pass by the central hole and take a few orbits before falling in. The gas falling into the black hole is like a bunch of pennies all swirling together on their journey toward the center. Throughout this process the disk itself is getting very hot from frictional forces. Because it is so hot, it is also very bright. When Kip takes that light and plugs it into the space-time geometry, it gets warped around in very interesting ways, creating the magnificently complex image you see in the movie. This movie probably has the most realistic visuals of any sci-fi movie I’ve ever seen. It also does a good job representing zero-g and “artificial gravity” from centrifugal forces. However, the science begins to take an unfortunate turn when the planets make their entrance. I let out an audible groan in the theater when I realized the three planets the crew would be exploring were orbiting a supermassive black hole. Planets usually form at the same time as their parent star, but black holes as big as this one do not form like normal stars, so the planets could not have formed this way. No explanation was given as to how these planets came to be orbiting the black hole. Planets often escape the gravitational pull of their original stars, so it is possible (though very unlikely) that several of these planets found their way to the black hole and entered into stable orbits around it. It is also possible (though even more unlikely) that the planets formed in the accretion disk around the black hole. An additional problem is that supermassive black holes tend to exist in regions dense with stars. In our Galaxy, stars orbit rather close to the supermassive black hole, which does not promote the existence of stable planetary systems. These planets are also (somewhat) habitable, meaning they must be warm. They apparently get their heat from the black hole’s accretion disk which, while far-fetched, is not necessarily impossible since it should be hot and emitting a lot of light. It could be just as bright as our sun, though the spectrum of that light would probably be much different. The first planet they visit is also the most interesting because it is so close to the black hole. Unfortunately, it is the source of serious physics issues. Time on this planet becomes dilated by a factor of about 60,000 (1 hr = 7 yrs) with respect to observers far away. General Relativity states that time is relative and is affected by gravitational fields, so this makes sense, at least at first glance. However after a quick calculation (using these equations:http://en.wikipedia.org/wiki/Gravitational_time_dilation), I found that in order to feel this amount of time dilation the orbit must be very close to the black hole. So close that this planet should probably be inside the accretion disk. At worst, the planet should be vaporized. At best, it’s atmosphere would be ripped off. At the very least, it should not be so temperate on the surface. This is only a rough calculation, but this orbit is rather dubious. Another interesting consequence of being so close to a black hole is the tidal forces. The force of gravity changes very quickly with distance close to a black hole. The side of the planet closest to the black hole feels a stronger force than the opposite side, causing the planet to be stretched along the direction of the black hole, much like the earth is stretched due to the moon’s gravity. As the planet rotates, different parts cross over a high tide ‘bulge’ on either side of the planet. With tides as strong as this planet should experience, you might see something like the wall of water depicted in the film, but it wouldn’t be a wave. A person on the surface would just rise up and down as their position passes over the high tide region; it wouldn’t really seem like anything was happening. The water isn’t moving over the surface, the surface (and the water) is moving over the tidal bulge, a point in space relative to the black hole. The movie makes it seem like tides are a sudden, catastrophic event, but they are not. I won’t speak to the realism of the other two planets because I’m not a planetary scientist. Instead I will end as the movie ends: with Matthew McConaughey falling into a black hole. If anyone has heard Neil de Grasse Tyson speak about black holes you’ve probably heard the term “spaghettification”. If you are falling toward a black hole, eventually the force of gravity is so much stronger at your feet than at your head (tides again!) that you get stretched and ripped apart. So, our hero should have died, right? Nope! Tides are very sensitive to distance. You have to be very close to a massive body before tides become strong enough to rip apart something as small as a human. The more massive a black hole, the farther away the event horizon, and this is a supermassive black hole so the event horizon is rather far away. When Matt crosses the event horizon, he should not feel enough tidal forces to be “spaghettified”. There were several other instances in this movie that made me wince (e.g. when the broken space ship immediately begins to fall into the black hole after orbiting the ice planet) but I won’t go through them here. In terms of the science, the movie had serious faults but overall wasn’t bad, especially compared to the average mainstream sci-fi movie. The visualizations were fantastic and the plot explored many scientific concepts never before touched by mainstream Hollywood. However, many things were far-fetched, particularly the planets. In addition, by ignoring many of the details, I fear the public may be open to misconceptions regarding planetary science and black hole physics. Still, it was a good effort that hopefully will inspire more movies where science is center stage, rather than just an afterthought.